Attic vents and roof venting serve a variety of purposes, depending on roof design and climate. These purposes include preventing ice damming, drying building materials, and controlling solar heat gain. In cold climates, we want to avoid ice damming by keeping the roof deck cold. In all climates, we want ventilation air moving against the roof deck to help keep our vulnerable roof deck dry. Roof ventilation also helps to prevent solar heat gain from damaging roof materials like foam insulation and asphalt shingles. The safest roof venting strategy is a gable roof with a ventilated attic with attic vents installed at the eaves and at the ridge. The International Residential Code (IRC) specifies one square foot of vent area for each 300 square feet of attic or roof surface area with a ceiling vapor retarder and high-low vents. This requirement assumes a continuous eave (soffit) vent. The high vents may be a continuous ridge vent, gable vents, or mushroom vents installed high on the roof. A continuous ridge vent is the most effective of these options. Without a vapor retarder, the IRC requires one square foot of vent for each 150 square foot of attic or roof surface. Placing 40% – 50% of the vent area near the eaves and the remainder as continuous soffit vents provides most effective ventilation, according to the IRC. An insulated and unvented roof, known as a hot roof can cause ice damming. A leaky ceiling under a vented attic can also cause ice damming. When part or all of a roof deck becomes warm in winter because of heat flow from indoors, snow melts on the roof. Snowmelt on the roof happens a number of ways. Complex features of the roof have no ventilation: dormers, hips, valleys, skylights. When the melted water reaches the colder roof surface over the eaves it refreezes, causing destructive ice damming. The eaves remain cold because of their exposed overhang. Obviously, this is only a problem in climates with cold, snowy winters. The cold outdoor ventilating air cools the well-ventilated roof deck as it travels from low vents to high vents. 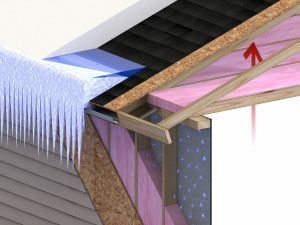 The cold roof avoids melting snow and ice dams. The same outdoor ventilation air drys dampness in roof deck or insulation during warmer weather. In regions with high winds, a ventilated roof may need special roof vents designed to block wind-driven rain and snow. 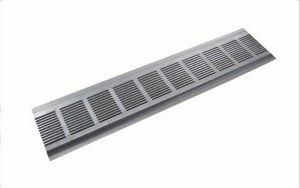 This vent protects an attic or roof cavity from wind washing, snow infiltration and rain infiltration. When architectural detailing and design employs multiple levels and roofs, the architect and builder should work together to specify and build one of these options. Attic and roof vents can leak a lot of water during storms where wind blows the rain or snow horizontally. Vents can also lead to wind blowing around in attics and moving fibrous insulation. The most vulnerable vents are gable vents and vented steel, aluminum, and vinyl soffit material. The wind can dislodge the suspended soffit material, if installers didn’t fasten it securely. For soffits in high-wind zones, fasten soffit material with screws to solid backing material, such as furring strips attached at right angles to the truss tails. Alternatives to soffit venting include roof-edge mounted wind-resistant vents that work well with cathedral and vaulted roof designs. Ridge vents can also blow off during high winds if not adequately anchored. Select a ridge vent that is approved for hurricane zones. Roofing nails every foot or so aren’t adequate to anchor a ridge vent in high-wind regions. Instead use gasketed roofing screws every 3 to 6 inches, including finding a rafter as often as possible. 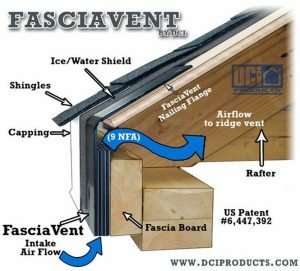 These attic venting methods very common and we’ve been using them for a long time. However, home buyers and home builders love design features like sloping ceilings. So in part 2 of this series we’ll explore some roof venting options that complement insulated roof cavities and insulated roof decks. Look for that in the next post. Attic Vents and Roof Venting – Part 2: Beyond the Simple Vented Attic.